Hobart Unveils New Prowler Series Auto-Darkening Helmets for Expert Welders. 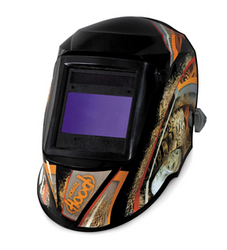 Hobart Welding Products introduces a new line of auto-darkening welding helmets. Designed for expert welders, the Prowler series features the largest viewing field / fastest switching speed of all Hobart's models. Appleton, Wis. (PRWEB) October 27, 2008 -- Hobart Welding Products today introduces the Prowler Series of auto-darkening welding helmets. The Prowler Series is designed for the expert welder and features a 2-3/8-in. x 3-7/8-in. viewing area--the largest of all the Hobart models--with four independent arc sensors that provide continuous arc-sensing capability for out-of-position welding. The debut model features a design inspired by the off-road community. The Off-Road graphic design pictures mud and dirt clinging to a massive tire and shock tower of a typical rock crawling rig. Even the Hobart logo wears an earthy badge of honor. It's dirty, it's fun; it's simply off-road. MSRP $329. Hobart spoke with numerous expert welders to select the right combination of features to build the right helmet for their needs; the result is the new Prowler Series. The first design in the series was inspired by the Off-Road community where welding plays such an essential role. The fabrication and fun is sometimes just as intense as the punishment these vehicles go through; it's an amazing sport, and an addictive hobby. Hobart is committed to providing attractive products that are comfortable and comply with the most strict safety standards for protective eyewear.Hobart offers its helmets through farm/ranch and hardware/tool retailers in the U.S. and Canada. Prowler Series helmets have an MSRP of $329, however prices and availability may vary by retailer. Set on top of a gloss-black finish, the Off-Road design captures the raw power and determination that drives this rough enthusiast sport. Mud and dirt is pictured clinging to a massive tire and shock tower of a typical rock crawling rig. Even the Hobart logo wears an earthy badge of honor. It's dirty, it's fun; it's simply off-road. The Prowler lens darkens in 1/20,000 of a second after arc start and features an internally adjustable auto-darkening shade (#9-13), lens sensitivity and delay controls. The #4 ultra-clear "light-state" makes setup and repositioning of hands and parts more efficient while providing continuous UV and IR protection. "Hobart spoke with numerous expert welders to select the right combination of features to build the right helmet for their needs; the result is the new Prowler Series," says Caleb Krisher, product manager, Hobart Welding Products. "The first design in the series was inspired by the Off-Road community where welding plays such an essential role. The fabrication and fun is sometimes just as intense as the punishment these vehicles go through; it's an amazing sport, and an addictive hobby." Hobart Welding Products designed the Prowler Series to be durable and lightweight weighing in at 11 oz. Prowler helmets feature solar-assisted auto-darkening lenses and easy-to-replace lithium batteries that last up to 3,000 hours when MIG welding. The Off-Road helmet comes with five external and two internal protective lens covers. The Prowler Series improves comfort and eliminates pinched hair with a re-designed ratchet-style headgear and CoolMax® odor-absorbing sweatband. "All Hobart Hood auto-darkening helmets meet current ANSI, CSA, and CE safety standards," says Krisher. "Hobart is committed to providing attractive products that are comfortable and comply with the most strict safety standards for protective eyewear." Hobart's Prowler Series welding helmets are covered by a 2-year warranty. 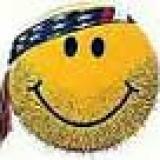 For information on selecting the right helmet suited for your application and budget, visit www.HobartWelders.com, call 1-877-HOBART1 (877-462-2781) or write to Hobart Welding Products at P.O. Box 100, Lithonia, GA 30058.